If your dates are not available on our calendar, please contact us anyway. We have another 2 bedroom condo in this same building (VRBO # 405468). Don't forget to check out all of the units we have available on VRBO. Greetings from Dan and Debra. We would like to introduce you to our Ledges condo (Building 10, unit 1032) and the many features that await you for fun and relaxation. Please read the description below. We are here to assist you in any way we can to ensure that you have a relaxing, fun time at the lake. We have been renting our condo for several years and we have many satisfied customers. If you have any questions after reading the details below, please contact us and we will be pleased to provide an answer. VIDEO TOUR: A video tour of our condo is now available. Just click through our photos to find the video tour. The Ledges is close to all that Osage Beach has to offer. Shopping is nearby. There are lots of restaurants to satisfy every taste. There is nightlife to satisfy most anyone. 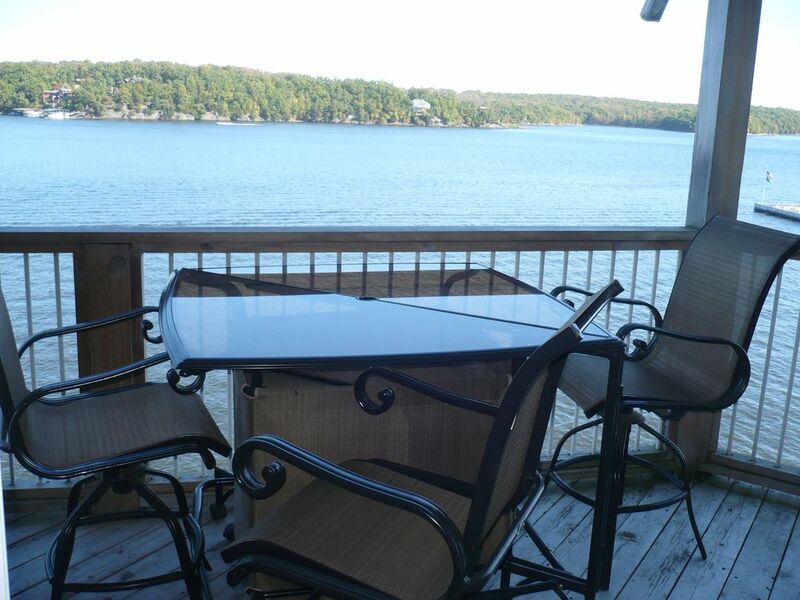 Are you looking for a great view of the lake? You have found that view with this condo. There aren't many condos in this area of the lake with this remarkable view. The balcony has an unobstructed view of the main channel. You can also sit in the comfortable living room and have an equally wonderful view. The lake is even reflected in the mirrored living room wall. When you awake in the master bedroom, you will be able to look out of the large window and have that same magnificent view. One of the most prominent features of our condo is the balcony which overlooks the main channel. Sip a cool drink as you sit on the comfortable lounge furniture and watch the lake activities. The covered balcony provides a haven from the heat of the day and the ceiling fan generates a refreshing breeze for those afternoons and evenings. In the evening, listen to the water lapping up against the shore as you reflect on the fun activities of the day. Are you looking for a hassle-free vacation? Our condo is fully furnished with high-quality furniture. The master bedroom has a king bed and the second bedroom has a queen bed. There is a hide-a-bed in the living room (with foam topper for extra comfort). The TV and home theater fill the living room with the sounds of your favorite movies or the music from your own cd's. Each bedroom has a TV (incl. game ports) and a dvd player. We also now offer free wi-fi internet access so that you can keep family and friends updated on all the fun you are having. If you decide to eat in instead of visiting one of the many local restaurants, the kitchen is fully equipped with everything you need for preparing small or large meals. There is also a BBQ grill on the balcony for those who enjoy cooking in the fresh air. We have keyless entry into our condo. There is no need to worry about if you will receive the key in time for your check-in. We have removed that hassle. We try to think of everything, so that all you have to do is think about the fun and relaxation you will enjoy. If this condo lacks anything, let us know and we will try our best to have it available for your next visit. Are you a boater? We have a 12 x 30 boat slip or a 14 x 40 slip available for rental ($10 per night). Rental fee may be waived depending on length of stay. Our docks are close by for easy access. Trailer parking is available at the Surdyke Port 20 marina located very near the Ledges. Don't have a boat?? Fishing is allowed from the docks. PLEASE SPECIFY IF YOU NEED A SLIP WHEN INQUIRING. Please check our calendar. If we are booked for the time you wish to visit the lake, contact us anyway. Not ready to rent, but have questions? Contact us and we will try to help you find the answers you need. Our goal is for you to have a wonderful visit to our lake community. PLEASE NOTE THAT SMOKING IS NOT ALLOWED IN THE CONDO OR ON THE LAKESIDE BALCONY. SORRY -- PETS ARE NOT PERMITTED. Greetings. My name is Dan Sutton. My wife, Debra, and I have been sharing our condo with many satisfied guests since 2005 when we bought the this condo. We have been St. Louis area residents for over 30 years. I retired from a career in IT and Debra is a paralegal. I primarily handle the rental related activities for the condo, but Debra's invaluable assistance and insights really help to make everything run smoothly. I am a people person and I really enjoy the interaction with our guests. We feel that it is a privilege and a blessing to be able share our condo with others who wish to enjoy all the lake area has to offer. Many of our guests are first-time renters, but we have many folks who return often. We really enjoy being at the lake whether it is for relaxation or to perform tasks to enhance our guests' visits. We are always looking for ways to improve the lake visit experience for our guests. We really mean it when we say that we want to do all we can to assist our guests to ensure that their visit to the lake is relaxing and enjoyable. Debra and I actually started looking at rental properties in Florida. For several reasons, we decided to look closer to our home. We are very pleased with our choice of buying in Osage Beach. This location has so much to offer from shopping, to dining, to outdoor activities. Debra and I really enjoy hiking the trails in the nearby state parks. While we prefer to relax on the balcony and cook on the grill, there are many restaurants available from fast food to fine dining. There are many activities available for both adults and children. A number of our guests come to hone their game at one of the many golf courses. As we read through the comments in our guest book we keep in the condo, we find a common theme. Our guests describe the view from our balcony. Some folks mention the many boats that they see, others describe the relaxing feeling of the calm of the morning, and others enjoy the view as they have drinks following a nice meal shared with friends on the balcony. I like it when guests share their thoughts about that first time they walk into the condo and realize that the condo and the view are even better than what they have seen in the photos or the video. Our fireplace has easy to use electric logs. No heat, but lots of atmosphere! Bath towels, hand towels, and wash cloths are provided for indoor use only. Guests must bring towels for outdoor use. Standard refrigerator with top freezer and ice maker. We supply paper products such as napkins and paper towels. Plan to bring any condiments or spices. DVD player and surround sound system in the living room. On the main channel with great views of the lake. Bar height seating for 4 plus extra chairs. Two pools and a small beach for the lake. The point pool has lake on 3 sides and great sunsets!